BHO is a concentrated cannabis extract that uses butane as a solvent to release all the cannabinoids, terpenes, and THC. It is often called honey oil due to its resemblance to the sweet viscous substance. There are many different varieties like budder and dust. BHO extraction if more often used for purer, clearer forms of marijuana concentrate such as glass and shatter. It is used on high quality marijuana buds, rather than trim or salvage weed. It is popular because many enthusiasts claim it provides the purest THC. It is useful to know that Butane Hash Oil is not legal everywhere that marijuana is legal. For example, In California, though marijuana laws are very liberal and medical and recreational marijuana are used, it is still a grey area when it comes to the area of concentrates. Making, possessing, or using marijuana concentrates like BHO, may not be legal under particular circumstances. It is in a category of its own and must be treated as such. You will have to look up the laws in your jurisdiction on this and other sites to see if marijuana or THC concentrates (waxing) are allowed to be used medically in your area. Step 1. Stuff your ground pot into the extraction tube. An extractor is a tube you can buy at head shops or purchase online. Above, you can see an extraction tube filled with ground bud being flushed with the butane. Your exactor will have a hole at the end for the cannabinoids dissolved in the butane to exit into your Pyrex dish. The tube will have a large hole at the end, a filter to take out as many impurities as possible. There will also be some holes at the top. Again, these can be found at head shops or online. 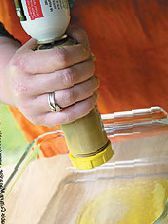 You will want to grind your weed, and pack the extractor tightly. Step 2. Flush your weed filled extractor with your pressurized butane. This step needs to be done outside so that butane and its fumes do not accumulate. Step 3. Evaporate all of the butane out in your double boiler. Step 4. Employ a vacuum pump to get rid of the last bit of butane and you have pure butane hash oil. Now, a note of caution. Do not make BHO yourself if you are not a professional. There are countless stories of non-professionals and sometimes even professionals causing an explosion and suffering severe burns while trying to make Butane Hash Oil. The butane is highly flammable and explosive. You need to be a practiced chemist to safely make BHO. So, don’t make it if you’re not. Just go buy some. On our site here, in general, is how you do it. This method is published on our site for informational purposes: https://www.ncsm.nl/english/diy/smoke-use-hash-oil If you really want to make BHO on your own, learning this method is a first step, you will also need to get real-world training from professional BHO chemists. Butane is a non-edible solvent used to quickly dissolve all the THC and other cannabinoids in your weed. The method above is the first step in making BHO wax, making shatter BHO, and making BHO oil. Whether you get oil, wax, or shatter depends on how you process the Butane Hash Oil which is the result of this process. BHO stands for Butane Hash Oil. Butane is a nonpolar solvent that dissolves all the powerful, polar cannabinoids, terpenoids, and other plant substances which add to the therapeutic efficacy of this powerful marijuana extract. This is generally accomplished by flushing a tube of cannabis bud with liquified butane, which quickly extracts all of the important substances. The next step is to evaporate off the butane, and this is where safety concerns come from. Butane is flammable and not great for consumption either. So, you have to get it all out and produce a pure and potent product. The result is an oily or waxy, resinous, and sticky product with extremely high THC content and is absolutely some of the most potent stuff you will ever come across. It is often used in smoking sessions in the same manner as other types of waxes and dabs. We have given you a glimpse of the best way to make bho shatter and other products. A common concern for first time users is the high THC content, for which they may be unprepared. It is also of concern that there may be left over butane in the final product. 1. Edibles Edibles bypass the need to inhale smoke of any kind which can damage the lungs. Only professionally manufactured BHO concentrates can be used in edibles. Butane is dangerous to consume. Dosing can be tricky with edibles. Also, many users aren’t interested in cooking or combining their treatment with food which may introduce allergies or other problems. 2. Vapor Vaporizing hash oil may cause less lung damage than smoking it. However, there is a theoretical risk of popcorn lung. You may have to use an expensive vaporizer which is made specifically to vaporize hash oil. Not every vaporizer which vaporizes liquid is suitable. 3. Topical Topical use (on top of the skin) can treat skin problems and arthritis. It does not harm the lungs and has fewer psychoactive effects. Topical use may be ineffective in treating nervous system and mood disorders as few cannabinoids absorb through the skin to reach nervous system receptors. 4. Smoke Smoking may be the strongest way to get the effects of BHO concentrates. Smoking can be done by adding oil to a spliff, smoking dabs in an oil rig, or in a bowl with healthstone as described on our page here: https://www.ncsm.nl/english/best-ways-smoke-wax-dabs Smoke of any kind may damage the lungs. Due to the speed at which smoke goes into effect, and the strength of BHO, heart rate and blood pressure could be temporarily elevated, leading to an increased risk of organ damage. 5. Tincture Tincture is exceptionally handy and can be used under the tongue. All butane must be removed before use in a tincture. Tincture is best made with an edible solvent like ethanol but professional manufacturers may produce varieties using BHO. Tincture cannot be made with butane still present in the oil. Stick to ethanol based tinctures unless BHO tincture is made professionally with strict quality control. Butane is not edible like ethanol. BHO is safe when made by qualified manufacturers. However, there are two main dangers when making BHO. The first is that butane, the solvent used in making Butane Hash Oil is highly flammable. When using it in an enclosed space, the area can become full of flammable fumes. The risk of explosion and fire is greatest when evaporating the butane out of the hash oil. This is why a double boiler is used. This has to be done very safely and at very low temperature. The second safety issue is that butane is not for consumption. Small amounts of butane are inhaled anytime you use a regular lighter, which uses butane as its fuel source. Some drug abusers huff butane in order to get high. It is the most commonly abused solvent in the United Kingdom. Though this is proof of it’s toxicity, it also shows that small amounts of which there may be residues in properly prepared BHO, are readily tolerated. Therefore, properly prepared BHO is likely to have a good safety profile as far as drugs go. However, improperly prepared BHO can have dangerous levels of butane left over. There are a few ways to tell the quality of your BHO. First, with oil, shatter, and other forms which are supposed to be clear, make sure the product is transparent. You should be able to put it on top of your desk and see through it. However, some hash oil products are not made to be transparent. For these, you will need to test them out by smell and by watching for flames. Since butane is highly flammable, concentrates with too much left-over butane will flame up when heated rather than producing a nice melting and fuming process. There may also be a smell of butane in the concentrate which has not been properly purged. When deciding which type of marijuana to use, you can consult our database of marijuana strains here: https://www.ncsm.nl/strain You may want a strain with a high THC content and which is resinous and full of trichomes. A strain which has a good taste may also be a concern, especially if you intend to use your BHO in edibles or tinctures. We recommend a Fruity Pebbles strain for taste, and good ole OG Kush for potency. Butane Hash Oil is a powerful way to make marijuana concentrates with up to 90% cannabinoids. That makes for extremely powerful medicine or a powerful recreational trip. It is therefore important to respect the dabs, the BHO oil, wax, and shatter. You should learn your tolerance before just taking in the dab hits. Use the experience of your doctor and peers. Not many if any doctors are prescribing dabs for issues but it may be on it’s way to treat intractable pain or nausea. It is even possible to make dabs with how THC and high levels of other therapeutic cannabinoids so it may only be a matter of time before BHO and other pure concentrates become a preferred method of medical and recreational administration. 1.3 How is BHO used? thing works like a charm. Even does regular old leafer and you get good oil. You can mix it into your E-pen and flavor it too. This thing makes enough to last you like 3months in only an hour. 4-5 butane canisters and bang 500$ in material.